Win a Motorised Slider With Videvo! We’re back with a brand new Videvo competition! Following the success of the April GoPro competition, we’re excited to announce that during July you now have the chance to win a motorised slider. 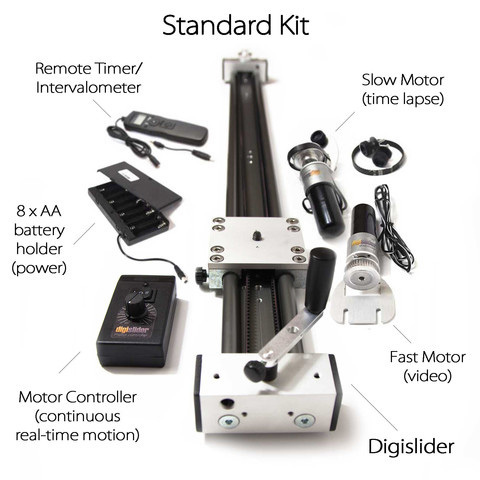 We’ve partnered up with Digislider to be able to offer you one of their incredible motorised slider kits! The model of the Slider will be the 100cm version of the Video & Timelapse Motion Control Kit. Simple! We are not going to write out a huge terms and conditions document or any small print for this contest, but here’s a few things to keep in mind. As mentioned above, only clips that are accepted by our moderators will be counted. For more information on uploading to Videvo, please click here. Clips uploaded before or after July 2014 (exact timings will be based on Eastern Daylight Time) will not be counted. The model of the Slider will be the 100cm version of the Video & Timelapse Motion Control Kit. The contest includes free postage to anywhere in the world (within reason). Digislider – motorised dolly slider for video and time lapse photography. from Digislider on Vimeo. We will post more information on the competition nearer the time, so for now, happy shooting!